Every four years presidential candidates face off and issues are debated. This year, however, you get to vote for a rabbit! What an opportunity! 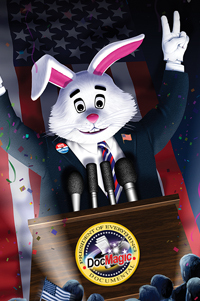 A vote for “Doc”, the Presidential DocMagic bunny, is a vote for cutting edge technology, top-notch compliance and stop-at-nothing customer service.